Immigration law is something that’s constantly changing, so it’s important that the immigration lawyer you hire is up to date. As an immigrant, it’s vital that you are aware of what’s going on as well. With so much upheaval surrounding immigration, it can be scary because there’s so much that’s not known. If you or your family is coming to the United States and you want to put together or you already have an immigration case, you need to take advantage of hiring a lawyer. An immigration lawyer will help with your application and provide you with the information you need to have the best chances for the outcome you want. At Zohar Law PLLC, we strive to be a law firm that you can depend on. We focus on immigration law and government policies that are connected to visas to allow you to work in this country. If you want to hire an immigration lawyer, then reach out to us today. Appointing a lawyer to your case can be a difficult process, especially if you’ve never had to do it before. If you’re from another country, then you may not know anyone to ask for a reference or you may not even speak English. It can be difficult trying to find the right immigration lawyer for your case, which is why we’ve put together three steps you can utilize when you decide to go down this path. Remember that finding the right lawyer will help open more doors to your situation. Whether you need a lawyer for yourself or your loved ones, at Zohar Law PLLC, we’re a reliable resource for questions and concerns about your case. While not everyone knows your preferences, a reference will afford you the opportunity to hire the right lawyer for your case. There are many ways you can get a reference for a lawyer. You can ask friends, coworkers, or family if you know anyone who would possibly be in contact with a lawyer. You can check the phone book — yes, those are still around. Living in New York, there are so many advertisements and information about lawyers due to the high population. Even if you only know one type of lawyer, then he or she can help you find an immigration lawyer. Keep in mind that for an immigration case, you’ll need a lawyer who focuses on immigration law. While it might be easiest to hire any lawyer, an immigration lawyer has the necessary experience and skills to get the best possible outcome for your situation. Once you’ve found a referral, it’s time to do some research. When you need any service or you want to buy a product, don’t you do some research to make sure it’s what you want? By checking online for the immigration lawyer’s references or the cases they’ve worked on, you can get to know what type of lawyer he or she may be. After getting that reference, even if your loved one says he or she is the best lawyer in the business, that doesn’t mean they are right for you. You’ll want to choose a lawyer that has your best interests in mind as well as one who can work with you fluidly. There’s nothing worse than butting heads with your lawyer, no matter what the situation may be. Once you’ve done some research and they seem to be a good fit, then it’s time to set up a consultation. In What Should You Ask An Immigration Lawyer?, we went over a few questions that you should ask an immigration lawyer when you go into a consultation with them. By asking these questions and interviewing the lawyer, you’ll have a good grasp on who they are and how they can help you achieve the best outcome possible. At our law firm, we take a personal approach to our clients by providing a one-on-one consultation. We’ll listen to what you need and consider your past and present situation. We’ll also take into consideration what you need for your future to strategize the best plan of action to ensure that your rights are protected and the legal status you want is right for your situation. 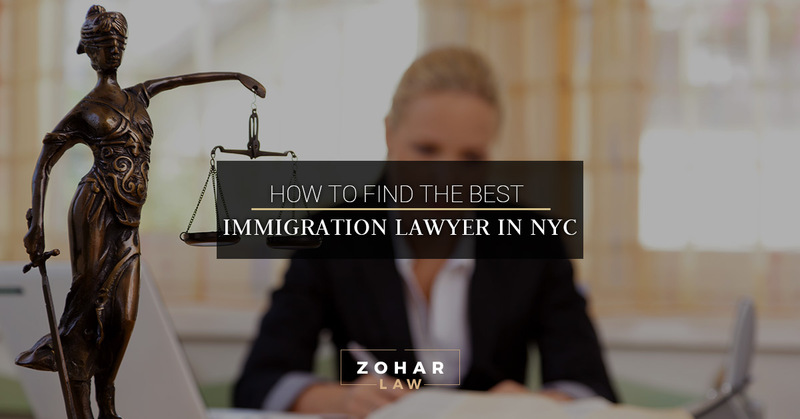 To find out if we’re the right immigration lawyer for you, then contact Zohar Law PLLC.